The challenge that I have set myself is to create a comprehensive understanding of what the options really are for a kid with particular prior attainment, and a particular learning style. It really shouldn’t be this hard. In an ideal world, I'd like to know what the likely outcomes of the different options would be - but this seems to be a stretch too far. Is a level 2 qualification enough to leave school with? What is a level 2 qualification anyway? 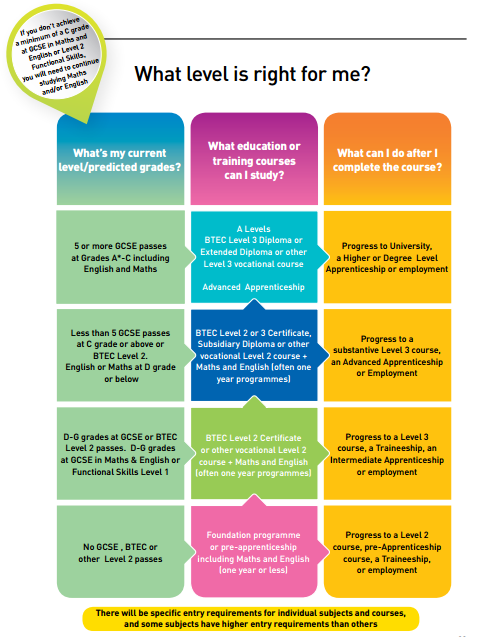 How can a GCSE really be a level 2 qualification AND a level 1 depending on the grades that a student achieves? Why are there so many different names for Diplomas? In short, it’s a minefield. And even with all those colours and explanations it’s still not totally straightforward. It relies on the reader to take into consideration the interests or ambitions of a particular student and to check out individual colleges and sixth forms to see what subjects are available at different levels - and whether that individual institution has regular prior attainment requirements. This gives some indication of how hard it is for individual teachers to offer impartial, informed advice to young people when pinned down for some informal advice at the end of a long day teaching. It is no surprise that many teachers rely primarily on their own personal experience of the system and struggle to provide a truly impartial and broad view of the opportunities available. But with less and less curriculum time and a lack of specialist careers provision in many schools, the responsibility falls to teachers, parents and individual students when the time comes at the start of Year 11 to make those all important course and subject decisions - and applications.